Looking for a deliciously simple recipe? 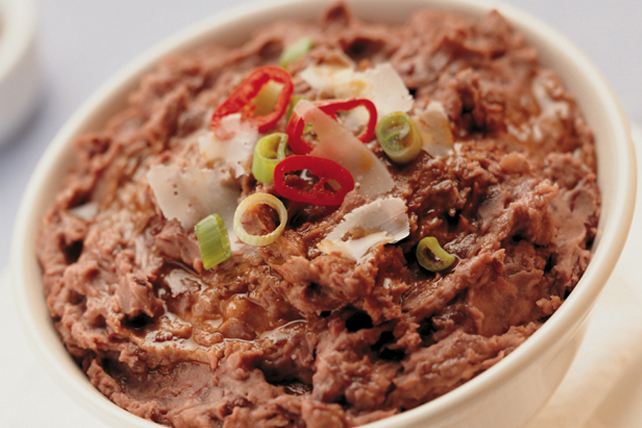 Our yummy Refried Beans couldn't be easier to make and great on top of a Mexican Layered dip or a topping for your next Burrito. Place beans in Dutch oven or small stockpot. Add enough water to completely cover beans; let stand 1 hour. Heat 1 Tbsp. oil in small nonstick skillet on medium heat. Add onions; cook 5 min. or until softened, stirring frequently. Add to beans along with the garlic; stir. Bring to boil; cover. Simmer on medium-low heat 2 hours or until beans are tender and start to split open, adding more water if needed to keep beans covered. Add, in batches, to food processor; process until smooth or of desired consistency. Heat 1 Tbsp. of the remaining oil in large nonstick skillet on medium heat. Add beans; mix well. Add Worcestershire sauce and remaining oil; cook on medium-low heat 30 min., stirring occasionally. Remove from heat; stir in cheese. Serve as a flavourful side dish, or as a filling for tacos or burritos. Garnish with sliced green onions and/or red chili peppers before serving.